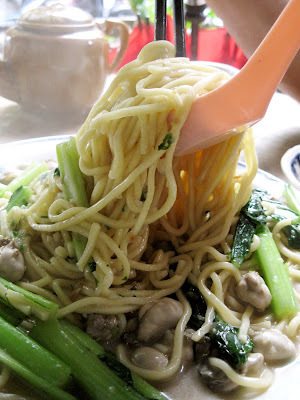 Penang Eating Spree Part 2 – Don’t bother counting calories! 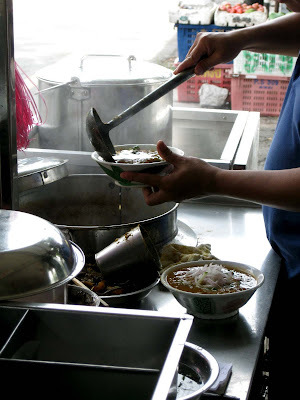 From my last article Penang Eating Spree, here is the second part of my eating adventure. This time around, I thought my trip up north was pretty productive, as I managed to try plenty of new places – some based on recommendations and some by pure luck. I have to thank Tommy Lee of The Star Publication for recommending this place to me – I really enjoyed my lunch! Since it was a full house, we waited for more than half an hour for our food. When the oh mee arrived at our table, I couldn’t wait to dig in and almost forgot to snap a picture of it. The gravy was not overly starchy and it had a hint of sweetness from the juicy oysters. The noodles tasted even better when they were left to soak up a bit of gravy. 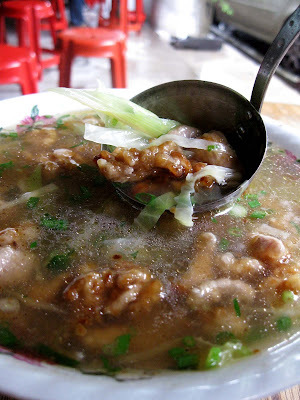 Bak Kee soup is made of pork slices which is coated with cornstarch and fried, before being added into a clear broth. The pork slices were smooth and slightly gluey, while the soup was well flavoured with cabbage, leek, pepper and chopped spring onions. 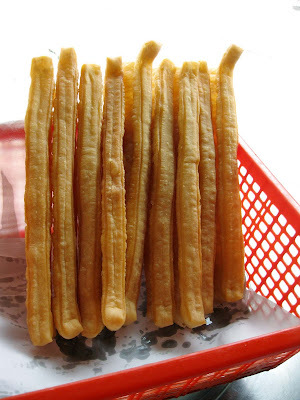 I also liked the oh chien; it was soft and moist at the centre, and wasn’t overly starchy. The oysters were tinier compared to the ones in the oh mee – they probably shrank during the cooking process. 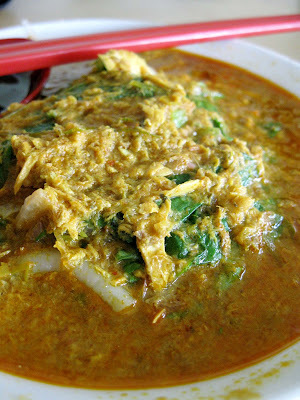 Many people raved about Balik Pulau’s asam laksa, so I had to try it for myself. 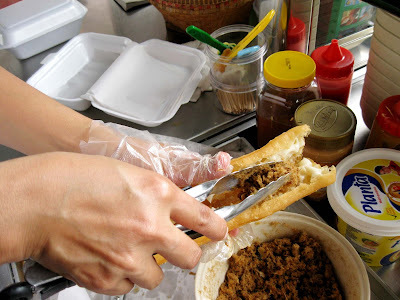 The stall is located in Nan Guang corner coffee shop, and it serves Asam Laksa and Siam Laksa (also known as laksa lemak). rif ordered the Asam Laksa, while I went for the latter. 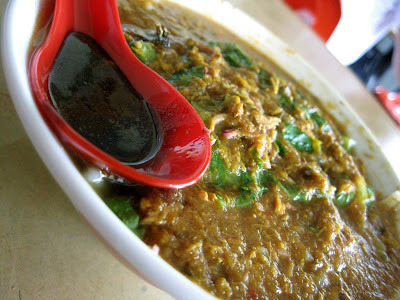 Asam is used to add sourness to the laksa stock. A bowl of Asam Laksa comes with lai fun and a thick soup of shredded fish, garnished with sliced shallots, cucumbers, pineapples, lettuces, mint leaves, chillies, bunga kantan and sweet shrimp paste. We agreed that the Balik Pulau Asam Laksa (RM3) wasn’t sour or spicy enough. It was not bad, but I think Air Hitam’s laksa tasted better. The Siam Laksa (RM3) on the other hand was very good. The soup is made from coconut milk, lemongrass and lime leaves. I loved the slight creaminess of the soup and it was not too sour. I wouldn’t mind coming back for more of this! Located at a corner of Air Itam road, it took us two attempts to find this coffeeshop. For those who are hopeless in directions like me, I’ve included the GPS below the address. 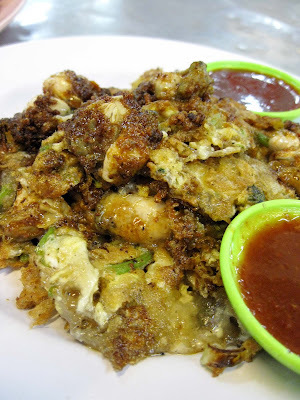 This oyster omelette (RM15) is by far the best I’ve eaten in Penang. 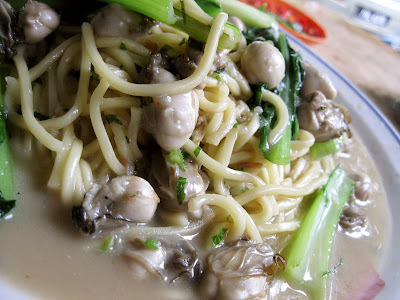 The egg batter is cooked with big, juicy oysters and finely chopped spring onions. 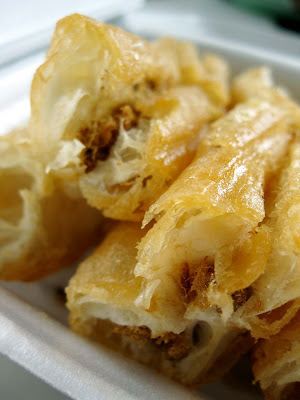 I reckon the oh chien here is nicer because it is wonderfully crispy on the outside and soft at the centre. 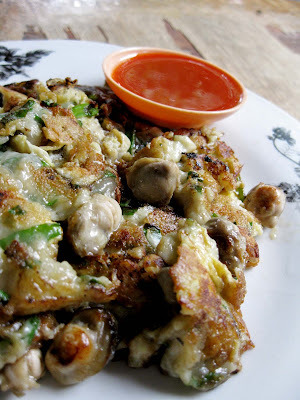 The cook uses plenty of spring onions in his cooking, which helps cut through the greasiness of the omelette, and gives the omelette a refreshing texture. I was lucky to get the last half of the pei pa duck (RM18 for half a bird) before the stall closed. It’s best to get there by 7pm, as they are sold out rather quickly. 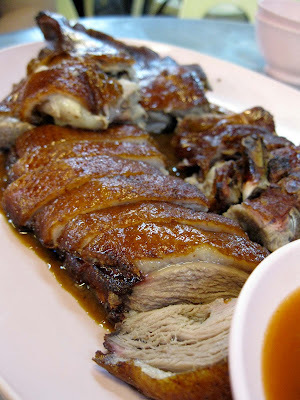 The duck skin was remarkably crispy and the flesh was very meaty and juicy. The sauce was savoury sweet with a hint of peanut, shallots and garlic. As a food lover, I’m always looking out for something new, and “out of the box”. Mr. Tan’s Yau Char Kwai was one of them. 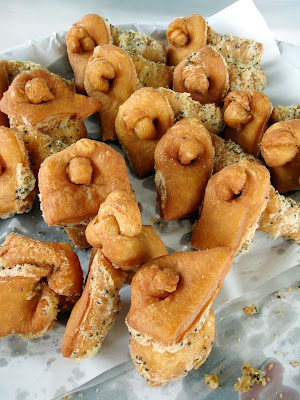 Here, the crullers are stuffed with different fillings such as kaya & butter (RM2), peanut & butter (RM2), pork floss & mayonnaise (RM2.50), tuna & mayonnaise (RM2.50), sausage (RM2.50) and honey (RM2). I ordered the kaya & butter, peanut & butter and pork floss & mayonnaise flavour. 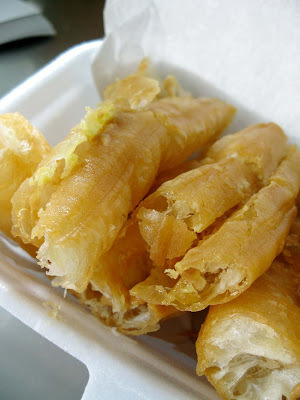 The yau char kwai was of just the right crispiness and they were quite generous with the filling. I liked the kaya & butter flavour, but it was the black and white sesame twins (RM2 for 3) that scored high in my books. The sugar glaze was not overly sweet, and the crispy butterfly crullers were fluffy on the inside. I regretted not ordering more of this. I used to think the best char kway teows came from Penang Island, until I tried the Duck Egg Char Kuay Teow (RM2.50) in Bukit Mertajam. 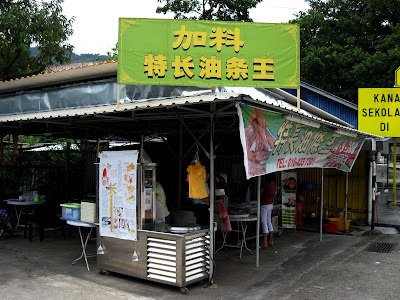 rif’s colleague, Tiang took him there to eat when they were in the mainland for work. The uncle is open for business from 9pm-2.30am. The char kway teow was aromatic and moist; I could smell it even from my table. 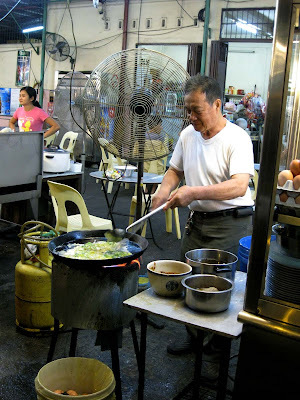 To make the noodles even tastier, we ordered a fried duck egg each (RM1). The egg came drizzled with dark sauce, which I soon learnt, was duck flavoured sauce. Double the cholesterol, double the tastiness! That concludes my 4 days of eating spree, and you might want to postpone your doctor’s appointment if you were to indulge like I did. And you might want to consider eating healthily for the next one week or two, depending on the severity of your gluttony! 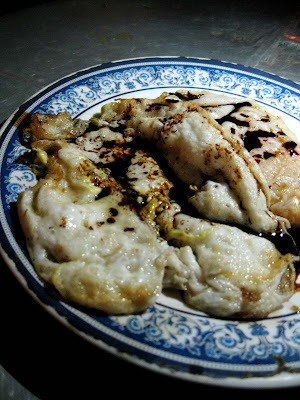 Best discover would have to be the yau char kwai at Paya Terubong. it resembeled the one that you could get in Malacca or K.K. but this just had a slight edge to it. 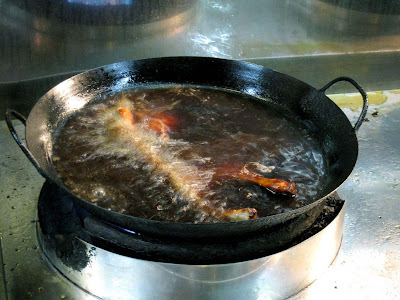 you can see that the owner/chef of the shop puts extra efford into making each and everyone of the yar char kwai. 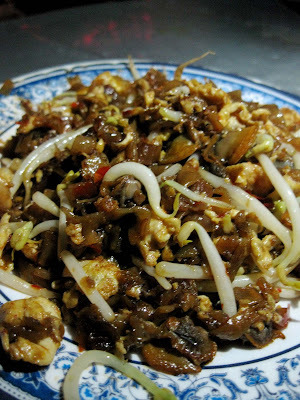 now THANKS to Tiang, i MUST stop in Penang mainland to have the MUST eat char kway teow!!! at this rate, i got to have a doctor by the side of me just incase the heart acts up while i stuff all that food in! With those kind of foods, my cholesterol level will definitely blow off the roof… lol!!! thanks, but no thanks! YES, just what I need to psych myself up for long overdue trip back to the old island this weekend! I have a Mayjah list of things to eat and guess what, you've just made it longer!! wah … what a run. I've never tried most of what you had, and especially interested in the BM's Duck Egg CKT. J2Kfm – Oooooo…I love that duck egg CKT! babe_kl – Ya lar…I was so fascinated with the yau char kwai. Must go back there next round! leo – Once in a while….ok ma! The food is damn tasty it is making me hungry!